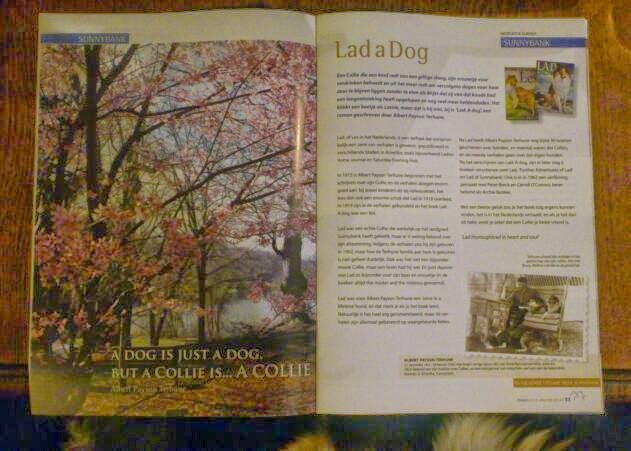 Last year I was very inspired, as our collieclub was in trouble finding people who could write for our magazine, I tried to make a series on Albert Payson Terhune, and the Sunnybank collies. Unfortunatly it ended after a few writings. I know I'm stubborn but the people on the other end who made the magazine where not easy also. Here is my first writing for the club. A collie who saves a child from a poisoned snake, who gets his misstress out of the lake and saves her from drowning, and then staying before her bedroomdoor, during her illness without wanting to leave her doorstep. It kinda sounds like Lassie, but it is Lad. Lad is originally written as a series of short stories, that has been published in magazines like Ladies home journal and Saturday evening post. Albert Payson Terhune started to write his stories about Lad in 1915, and they where very appealling to aswel adults as childeren, so it was a big shock when Lad died in 1918. In 1919 they put all togheter the stories, and book "Lad a Dog" was a fact. Lad was a real dog, living at the Sunnybank place with his Master and Mistress, but it is not quit clear how Lad came to Sunnybank, and about his heritage. He must have been born in 1902. He was maybe not the most beautifull collie of all, but he had a great brain and that is why he was so special to Albert Payson Terhune and his wife. You can imagine it was a once in a lifetime dog to them both. The stories of the book "Lad a dog" ar sort of less all related to real stories, but it is very romantisized and made a little more dramatic here and there. After Lad was finished Albert Payson Terhune wrote about 30 other books about collies and most of the time was a collie of his own hero of the storie. And there came 2 other books on Lad, "Further adventures of Lad" and "Lad of Sunnybank"